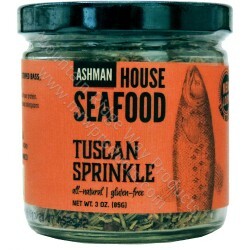 Step back in to old world Tuscany with this comforting Italian flavor blend sprinkled or rubbed into your seafood, meat or vegetables. Great on salmon, striped bass, tuna! Also tasty as a marinade or rub for chicken or pork! Sprinkle on vegetables. Try it in your pasta salad and as a sprinkle on pizza. 3 oz Jar. Gluten Free!